Heart-cut real 6mm x 6mm peridot gemstone earrings crafted in quality .925 sterling silver with rope-design edges and shepherd's hook post. Genuine sterling silver weighs a total of approx. 2.44 grams and is polished and rhodium-plated for a shiny finish. 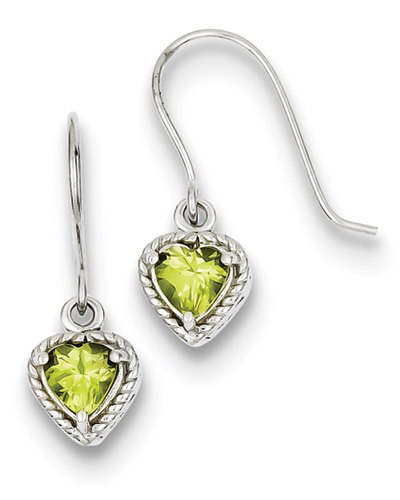 We guarantee our Heart-Cut Small Peridot Earrings in Sterling Silver to be high quality, authentic jewelry, as described above.